Southwest Airlines flight 345 suffered a failure of its nose gear upon landing on LaGuardia's runway 4. The aircraft skidded to a halt and was evacuated with only minor injuries. NTSB photos show the nose gear which normally folds forwards on retraction into the nose gear bay had collapsed rearward. The NTSB is investigating the cause of this incident and will determine if the landing was within normal parameters or not, and whether or not the nose gear suffered structural failure due to a defect. Available audio tape of the radio transmissions indicate that the aircraft had accepted a clearance for an ILS approach. As opposed to a visual approach, an ILS approach must be flown with reference to an electronic signal which should preclude a steep or unstabilized approach. An unstabilized approach is generally one of the contributing factors to a firm landing, though a firm landing alone should not cause the failure of gear components. Even a very firm landing as experienced within the aircraft is usually well within the design tolerance of most airliners. During a normal landing on an aircraft with tricycle gear, such as this 737 has, the main gear touch down first, followed by the nose gear as the aircraft decelerates. The NTSB has posted on it's website that video and other evidence indicate the aircraft may have touched down on its nose gear first. A nose gear first landing is highly unusual and could contribute to a failure of the landing gear. The NTSB has also tweeted on it's site that the aircraft pitch was a negative three degrees at touchdown which would be consistent with a nose gear first landing. The aircraft was landing with the maximum flap setting of 40 which generally means the aircraft will fly at a lower pitch angle than with a lesser flap setting. A maximum flap setting for landing is recommended for landing on short runways, as it results in a lower approach airspeed and less kinetic energy to stop. Also of note is that runway 4 at LaGuardia is a relatively short runway with only 7000 feet of pavement available followed by an overrun and water. When landing on a short runway, pilots must land by necessity in the first thousand feet or so of the landing zone and do not have the option of "floating" the aircraft in search of a smooth touchdown as might be possible on a longer runway. Should the landing not set up quite right, there is very little room for correction and the choices would be to either accept a firm touch down or to go around. 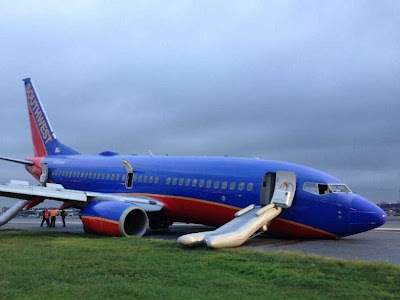 The investigation will undoubtedly uncover the exact cause of this incident, though if it is determined that the nose gear touched down first, these pilots will have some 'splainin to do. Stay tuned.